Healthcare industry has been undergoing various transformations since past few years. Nano technology in healthcare is one such reformation which is expected to enhance the efficacy of various healthcare platforms and offer sizeable opportunities to transform the field of healthcare with respect to diagnosis, treatment and prevention of various diseases. Biochips, implantable materials, active implantable devices etc., are few of the products used in the healthcare sector. Nano healthcare technology can improve the disease diagnosis by carrying out its incorporation in monitoring devices, bioassay as well as imaging. Persistence Market Research has done extensive research on Nano healthcare technology for medical equipment market. The exhaustive research portrays several insights, data points and statistics of the global market across key regions which can be used to assess the market scenario in the present and the future based on the past market landscape. The future projections, for a period of five years, can assist the reader in devising key strategies to carry out expansion programs and gain advantage in the changing dynamic scenario of the global market. To support this cause, the report also focuses on trends, developments, macroeconomic aspects, innovations and drivers that have an impact on the growth of the global Nano healthcare technology for medical equipment market in the years to come. The regional insights across important geographies also include sub regional analysis making the report more comprehensive and perceptive for the reader. 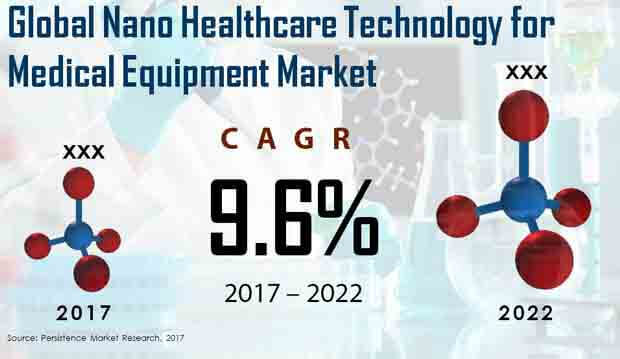 According to the research study, the global market for Nano healthcare technology for medical equipment is currently witnessing robust growth. The global Nano healthcare technology for medical equipment market is anticipated to grow at a stellar CAGR throughout the period of assessment of 2017-2022 to reach a value of about US$ 9.2 Bn by the end of 2022. The active implantable devices segment by product type is anticipated to carry on with its dominating streak during the 2017-2022 assessment period. In 2016. This segment portrayed immense growth and this is likely to continue due to a high 10% CAGR throughout the period of assessment. As of 2017, this segment holds a high market share thus leading the global market with respect to market value. It is also expected to gain the higher BPS by the end of the assessment period. By product category, both biochip and implantable materials segments show a robust growth rate throughout the 2017-2022 assessment period. However, implantable materials segment is a shade better as it reflects a higher market share as compared to biochips segment in 2017. But with the growing adoption of biochips, this figure is likely to change in the future. According to this research, the biochip segment is expected to run at a slightly higher pace than implantable materials segment to reflect a high 9.6% CAGR throughout the assessment period. The global Nano healthcare technology for medical equipment market research report has profiled key players such as 3M Company, Abbott Laboratories, AstraZeneca Plc., Ferro Corp, GE Global Research, Merck KGaA, PerkinElmer, Inc., Smith & Nephew Plc., Stryker Corporation and Thermo Fisher Scientific Inc. The research report covers a complete overview, key financials, developments, mergers and acquisitions, product portfolio analysis as well as SWOT analysis of these players.